This week’s topic is the words that I live by. 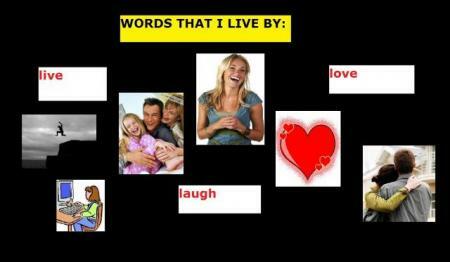 These words are: live, laugh, love. Live your life to the fullest. Make sure you do everything that you ever wanted to do. Laugh all the time because laughing makes you happy. And love – make long-lasting relationships with people you trust and people you want to have in your life. Surround yourself with people that make you happy. Make the most out of what you have. Your life can be great, no matter what happened in the past. You just have to believe in yourself, and don’t forget to live, laugh, and love! I really enjoyed getting your postcard about what is most important to you! I’m so glad that church is so important to you. I hope you are surrounded by great people and that you really love everything about it. Because of you, I am going to start going to church more!